Home > Light Duty V Belts > Gates Powerated V Belts. 3/8" thru 5/8" Widths. > Gates 6926 Belt (5L260K). 26" Length, 21/32" (17mm) Wide. Gates™ Green belts. Gates Powerated® 6926 Belt (5L260K). 26" Length, 21/32" (17mm) Wide. Gates™ Green belts. Gates 6926 Belt (5L260K). 26" Length, 21/32" (17mm) Wide. Gates™ Green belts. Gates Powerated® 6926 Belt (5L260K). 26" Length, 21/32" (17mm) Wide. Gates™ Green belts are an alternative to conventional light-duty belts. High performance construction delivers more horsepower and less stretch, providing longer service life. 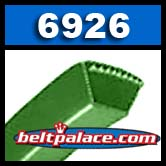 Gates 6926 POWERATED® V- Belts are Made in USA! 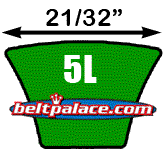 REPLACES: 5L260-K, 5L260, Gates 6926 FHP Belt. Can be substituted for equivalent sizes of Truflex V-Belts. Green Flex-Weave cover resists heat, oil and cracking. Superior performance on clutching and backside idler drives. Call Customer Service for additional sizes. (317) 519-9020.